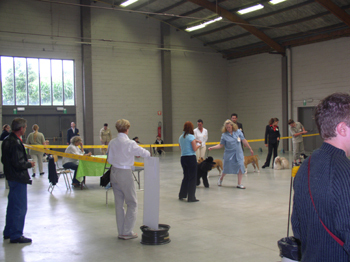 WELCOME BY KENNEL "VAN HET DAALHOF"
We are "KENNEL VAN HET DAALHOF" (BELGIUM) and we are members of the Royal Belgium Club of Terriers. We are able to answer your mail in ENGLISH. Nous pouvons repondre votre mail en FRANCAIS. Wir beantworten Ihre Fragen im die DEUTSCHE sprache. After more than ten years engagement with dogs, we have lost our heart to these beautiful "Amstaff Terriers". In a short time we have breed many excellent dogs and champions. 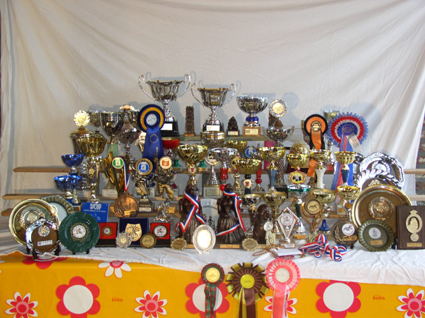 The trophy's from kennel "Van het Daalhof" give the proof of four years showing as well as at home as in foreign countries. You can also convince yourself of the documents which belong to these trophy's. Here are our premises hkv v.z.w. where we are training every week with our dogs. Here you see us during an "handling contest" where we perfectly stick up ourselves between professional handlers. 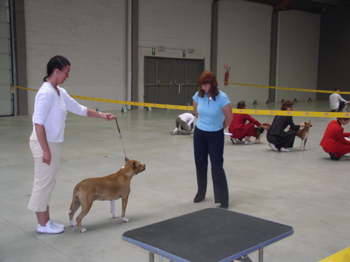 We will say: get an appointment with us and convince yourself about the quality of our dogs. By the way, all our Amstaffs have a "Sint Hubertus" pedigree which is also approved in the Netherlands. Furthermore get all the buyers of a pup coaching and a guarantee.